Evidence that the outer stone circle at Stonehenge was once complete has been found, because a hosepipe used to water the site was not long enough. Parch marks in the grass, in an area that had not been watered, have revealed places where two "missing" huge sarsen stones may once have stood. The marks were spotted by an English Heritage steward who alerted archaeologists to their existence. Previous scientific techniques such as geophysics failed to find any evidence. Historians have long debated whether Stonehenge was a full or incomplete circle, with some arguing a lack of stones in the south-west quadrant is proof it was never complete. Susan Greaney, from English Heritage, said the discovery seemed to indicate the positions of missing stones. "If these stone holes actually held upright stones then we've got a complete circle," she said. 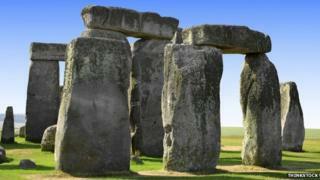 "It's really significant, and it shows us just how much we still have to learn about Stonehenge. "A lot of people assume we've excavated the entire site and everything we're ever going to know about the monument is known. "But actually there's quite a lot we still don't know and there's quite a lot that can be discovered just through non-excavation methods." Ms Greaney said a high resolution geophysical survey conducted a few years ago had failed to pick up evidence of the holes. "It's great that people who know the site really well and look at it every day were able to spot these parch marks and recognise them for what they were," she added. "We maintain the grass with watering when it's very dry in the summer, but our hosepipe doesn't reach to the other side of the stone circle. "If we'd had a longer hosepipe we might not have been able to see them." Tim Daw, who spotted the parch marks, said: "I was standing on the public path looking at the grass near the stones and thinking that we needed to find a longer hosepipe to get the parched patches to green up. "A sudden lightbulb moment in my head, and I remembered that the marks were where archaeologists had looked without success for signs that there had been stone holes, and that parch marks can signify them.